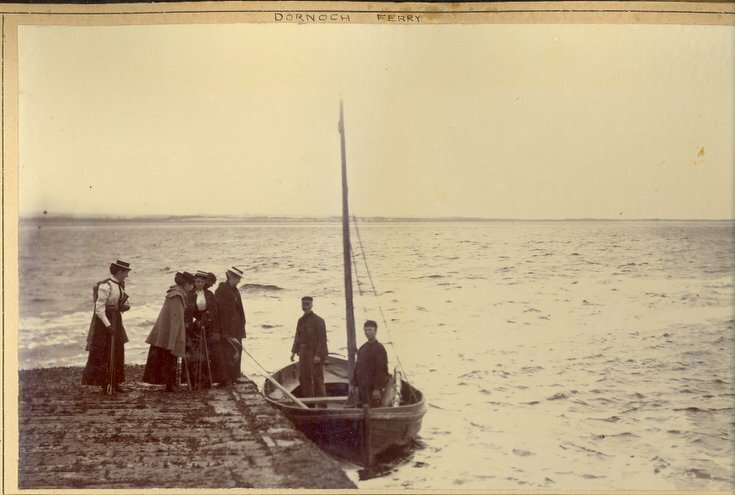 Monochrome photograph of the Meikle Ferry at a pier with four ladies about to board. Single masted ferry has a crew of two aboard and behind the ladies there appears to be a man holding a line to the ferry. The ladies are holding golf clubs and it is presumed they are the four sisters (2008_091_01) playing golf at Dornoch Golf Course. Ruby Grierson the great aunt of the donor lived in Rosemount, Tain.